S.O.S. 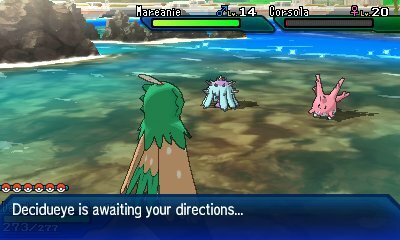 Battles are a new featured introduced in Pokémon Sun & Moon where wild Pokémon will call for help, and this returns here. This is most notably seen during the Totem Battles in the Island Trials, but they also happen in standard wild encounters. As a Pokémon gets lower and lower in health, they will often call for help. This will bring another Pokémon into the battle, causing it to become a Double Battle against your single Pokémon. .
As the S.O.S. Battles chain, there are a variety of perks. As the chain increases, you have a higher chance of getting Pokémon with maximum IVs, capping at 4 max IVs. This is also the only way you can find Pokémon with their Hidden Abilities. In addition to that, the likelihood of encountering a Shiny Pokémon also increases. This resets when an SOS Battle ends either through defeating all Pokémon or by causing a Pokémon of an evolution line different to the original Pokémon be the last on the field. S.O.S. Battles can happen in any battle, but due to the Effort Point element and Shiny Pokémon element, you may wish to force it to carry on. There are many ways to make S.O.S. Battles more likely. The first is to simply keep the Pokémon at a low amount of health. A move such as a False Swipe will work for this. Here, the Pokémon has a higher chance of calling for help. It won't call for help if it currently has assistance. 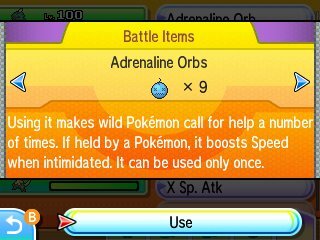 As of Pokémon Ultra Sun & Ultra Moon, this has been altered to have it so wild Pokémon will only call for help once unless you use an Adrenaline Orb. The ability of the Pokémon you have in battle is also one that factors into S.O.S. Battles. If your Pokémon has the abilties Intimidate, Pressure or Unnerve then the opposing Pokémon is more likely to call for help. Do note that even if a Pokémon calls for help, it is not guaranteed that a wild Pokémon will come to its aid. If it is afflicted by a status condition, then it will not call for help. 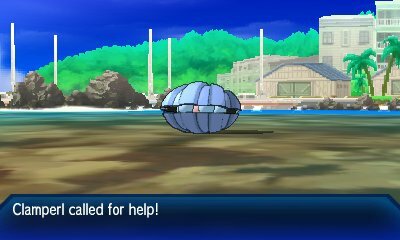 Legendary Pokémon and Island Scan Pokémon will not call for help. Minior & Komala also won't call for help. The even better thing about S.O.S. Battles is that they don't necessarily call the same Pokémon. In the encounter listings, there are up to 8 different rows of Pokémon and when a Pokémon calls for help, it will select a random encounter row and give you a Pokémon of the same slot in that row as the Pokémon you are facing. Our Pokéarth Section allows for checking these tables. In addition to this, certain forms of Floette and Flabébé can only be obtained through S.O.S. Battles. In some areas of the game, there is often natural weather. In Malie Garden, Exeggutor Island, Lush Jungle and Route 17, there is rain. In Haina Desert, there is often a Sandstorm and in Tapu Village & Mount Lanakila, there is snow. With this, when the weather is in effect, the game will instead shift to include a new and unique SOS Battle table. This table provides unique Pokémon that can't be found anywhere else except within the S.O.S. Battles during the weather. This means getting the Pokémon can be somewhat tricky. However, there is a twist with this. In these areas, you are able to use the corresponding weather move in the areas in order to bring the Pokémon. It doesn't have to be natural weather.